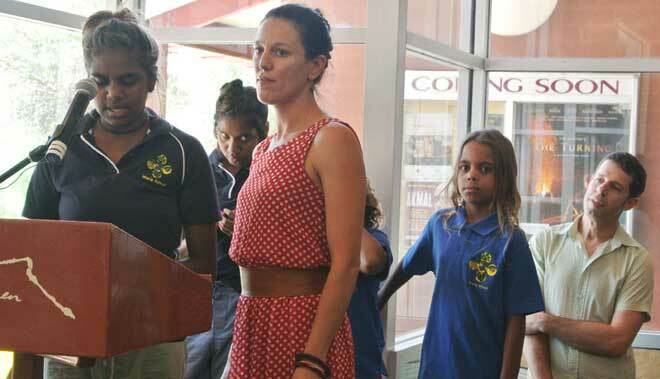 From left: Ntaria School students Semra Williams and Darelle Lankin, Big hART’s Sophia Marinos, and at rear Araluen curator Stephen Williamson. The worth of investing in the artistic development of the fifth generation of Namatjira descendants, most of them still school children, is clear. Of the fourth generation only Elton Wirri, born in 1990, has really made a name for himself as an artist. And how did he do it? By starting young – when he was ten years old – painting alongside his father Kevin and with application, over and over. Kevin Wirri had done the same, sitting down alongside Albert Namatjira and later with his sons, Keith, Ewald and Oscar, and then Clem Abbott. This is what the young people are once again doing now, thanks to the commitment of artists of the third generation with the support of Big hART ( the arts and social innovation organisation) and Ntaria School. 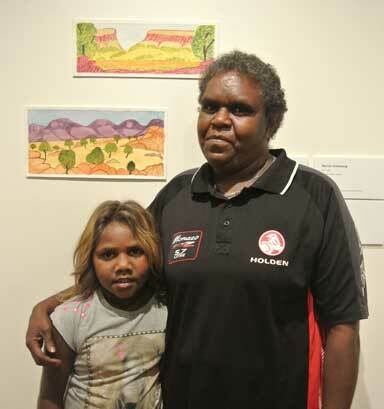 It’s a “good experience for them” and “hopefully they’ll keep it up for the next sixth generation”, said respected third generation artist, Gloria Pannka when she spoke to the crowd gathered for the opening at the Araluen Arts Centre of the exhibition, Five Generations: the strength of Namatjira’s legacy. 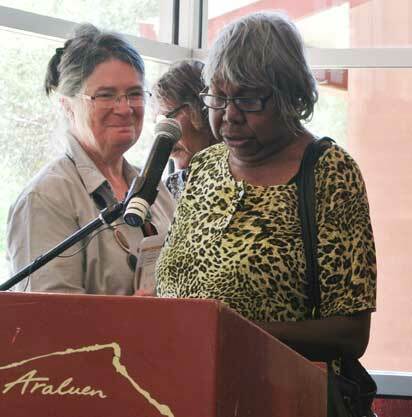 Right: Artist Gloria Pannka with Namatjira scholar Alison French. She recalled her “fond memories” of sitting down with her father Claude Pannka and her “best uncles” – Albert’s sons – “ doing painting, talking story”. Claude, along with the Pareroultja brothers Reuben and Edwin, was taught by Albert himself. “We all used to sit and paint at Morris Soak … now we are encouraging our young ones,” she said. 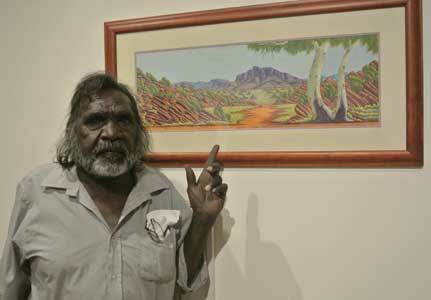 Big hART began working with the Namatjira family in 2009. Out of this came the acclaimed play Namatjira which has toured around Australia and to the UK. But typical of Big hART’s partnership approach there has also been work behind the scenes. The future of the watercolour movement celebrated by the play was an obvious focus. Artists of the third generation who embraced the play were “keenly aware of fragility of the movement”, said Sophia Marinos, creative producer for Big hART. They knew that “without a process by which to get the young ones painting and learning about country” the tradition “could easily fall away”. 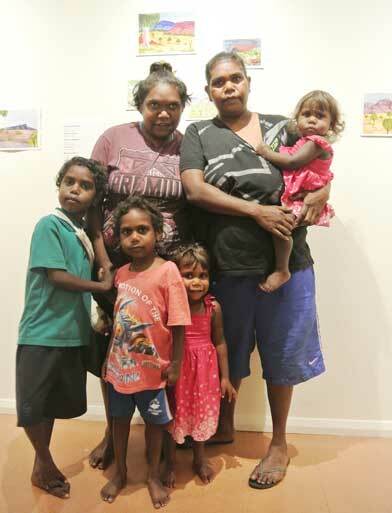 Ntaria School responded, building a program of workshops into the curriculum, with the senior artists taking the students out into their country, telling them the stories, painting with them, teaching by example. Darelle was too shy to read her speech herself, so Sophia did it for her: “We feel proud to paint our country and I also feel proud to show people how beautiful and colourful our country is,” she said. She also thanked the “older painters”, mentioning Lenie Namatjira as well as “Wendy [Cowan] and Melanie [Inkamala], our teachers”. From among the students may come “the next big thing in the art world” and that’s “a very worthwhile ambition”, said Alison Anderson, Member for Namatjira (at left, the only elected representative present at this important event). “The reason why you got Pintupi Luritja people so interested in watercolours is because [Albert] Namatjira actually lived at Papunya,” she said. Her grandfather Epaphras and Albert were brothers – “ in Anangu way, our way” – so it was with particular pride, as Albert’s granddaughter and as the first Member for Namatjira (the electorate having been formerly known as MacDonnell), that she opened the show. But she also wanted to stress the connections between “people of different cultures”, for the watercolour movement began almost 80 years ago with the relationship between the white Australian painter Rex Battarbee and Albert Namatjira. 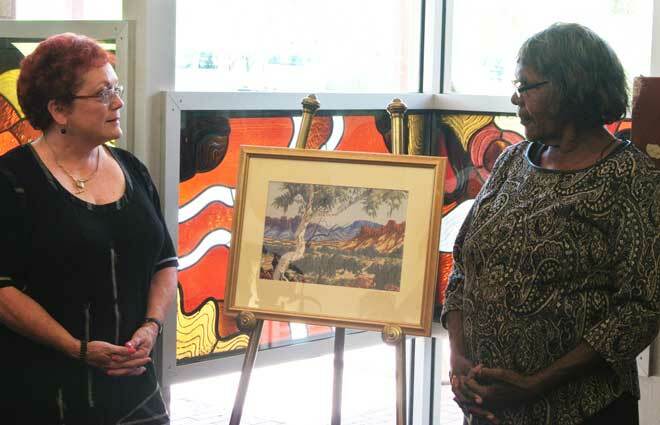 She saw their shared love of “the landscape and colours of central Australia” in the people and work brought together now at Araluen for the exhibition – “living history”. Alison French also felt this aliveness – “the generation of energy that comes from people who teach their children and who think that it’s important that everyone sees the places they live in”. She referred to what Lenie Namatjira had said in her softly spoken opening remarks, that “Albert and Rex are both her grandfathers, her grandfathers in her painting tradition”. Right: Lenie Namatjira pointing to the painting by Michelle Malbunka, gifted as a postcard to the Queen when she and her brother Kevin met her in November last year. The introduction and invitation to the Queen and Prince Charles “to come and paint on country” was made as part of the events surrounding the UK staging of the Big hART play Namatjira. Alison Anderson evoked the importance of landscape to Aboriginal people – it is “country and tjukurrpa – the colours of landscape and the colours of dreams are all one, landscape is part of the being of the artist, part of who they are”. The exhibition will be a major drawcard at Araluen this year, showing until November 16. Spanning the five generations it is necessarily a big show, probably the biggest yet for Araluen’s curator Stephen Williamson and hung with his usual attention to making the links between works and between artists. It is presented in partnership with Big hART and the Ngurratjuta Iltja Ntjarra Many Hands Art Centre, drawing on works from Araluen, Museums and Art Galleries of the NT, and the Ngurratjuta collection. Some works by the early generation painters have not been shown to local audiences before. 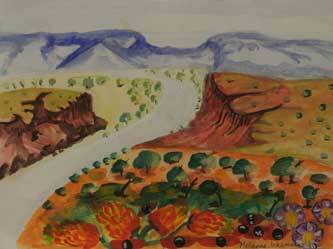 These include the last painting done by Albert from his sick bed in the Alice Springs hospital. It was gifted to the Namatjira family by Tasmanian resident Judith King and unveiled at Saturday’s opening (see photo at bottom). 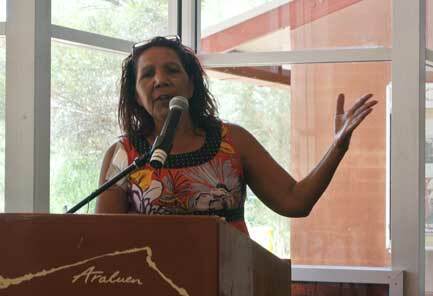 Judith made contact with the family through Big hART when the production Namatjira was staged in Launceston. Her mother had nursed Albert in his last illness which is how the painting came into her hands. The Namatjira family have decided that the painting will now be housed at Araluen where one gallery is permanently dedicated to the display of works by Albert and the artists following in his footsteps. By Beth Inkamala, teacher’s assistant at Ntaria School. By Melanie Inkamala, teacher’s assistant at Ntaria School. 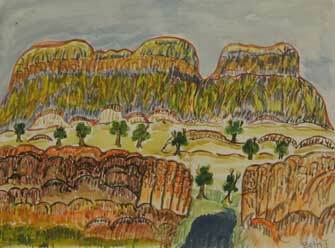 East MacDonnell Ranges, 2012 by Lewina Namatjira. 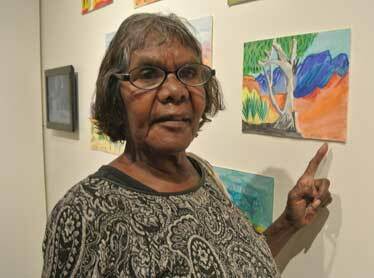 Lewina Namatjira in front of her work. Mount Wedge by Martha Namatjira, 2010. 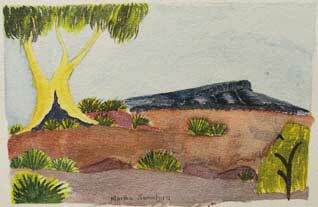 Martha Namatjira (back left) and Barbara McCormack, both of whom are starting to paint now. Established artist Kevin Wirri with his work. Judith King and Lenie Namatjira with Albert Namatjira’s last painting.